Reducing inflammation, losing weight, brightening the eyes and skin, improve sleep, increase physical energy, improve mental health, reducing and anxiety and stress. ~ understand ourselves more fully to support positive steps forward toward our goal. The Wonder of Life, Wellness Retreat will begin on Tuesday 21st May at 4pm and conclude on Monday 27th May at 11am. 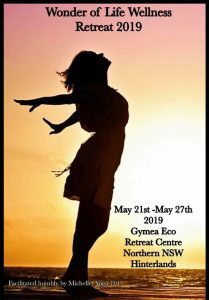 Pricing: includes accommodation in your choice of single or double room, all meals, all workshops, workshop manual, all classes, one 60 minute massage spa treatment, a two hour healing circuit in the sauna, steam room and magnesium healing spa. ~ If you are deciding to attend and share a room with a friend, the investment is $2260 per person. Flights and transfers will have to be organised by each participant at their own discretion.